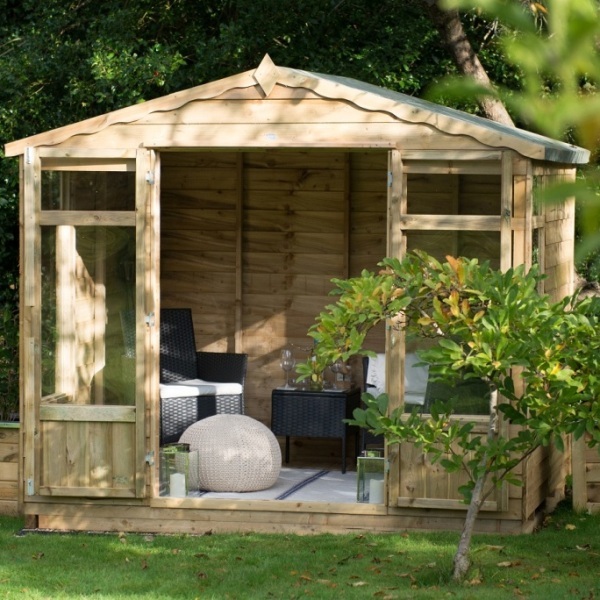 The Oakley Overlap 8 x 6 Summerhouse from Forest is bursting with potential for your garden, transform the space into an office, play-room, outdoor dining space or more. The traditional overlap panel construction encourages rainwater to run off the structure and the roof has been finished with a high quality mineral felt to keep the contents within safe and dry. The large 3/4 length glazed windows and doors bathe the interior in sunlight and are made from shatter-resistant acrylic; a much safer alternative to glass. 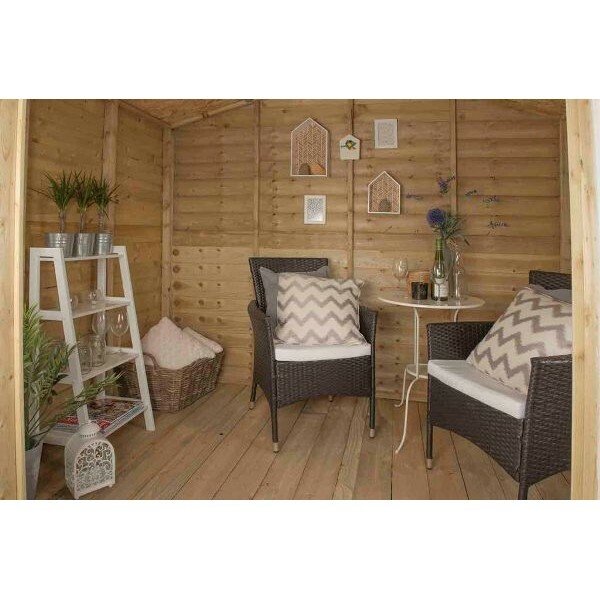 The double doors provide easy access into the summerhouse and come fitted with padlockable sliding bolt (padlock not included) for additional security. A solid boarded timber floor is included to allow heavy items (such as furniture) to be installed with no issue. All of the timber has been pressure treated, providing the ultimate level of protection and even comes with a 15 year manufacturers anti-rot guarantee for additional peace of mind. 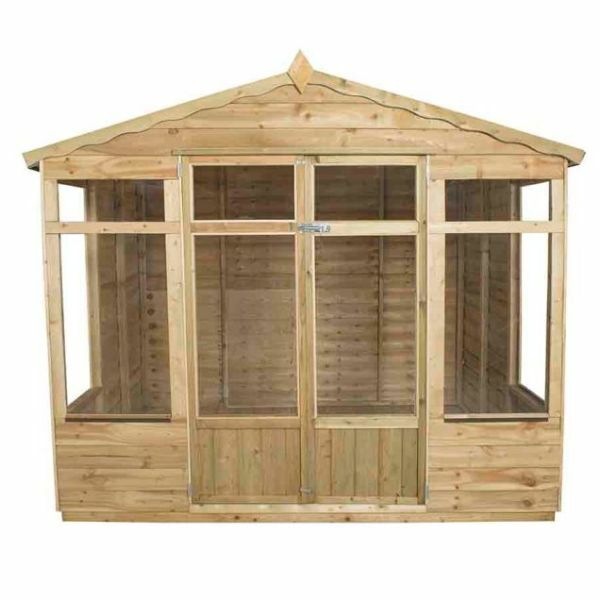 This product comes as a self assembly kit with all instructions and fittings supplied, but if you would prefer to leave all the hard work to the experts at Forest, then opt for a home delivery and construction package. If you don't have the requisite DIY skills a home assembly service is available on this summerhouse. This nationwide* service is conducted by the skilled Forest installation team at an agreed time which is convenient for you. Please note that this service is assembly only and does not include laying bases or disassembling existing buildings. Please ensure you have a suitable base in place before ordering this service. The Oakley Summerhouses from Forest are constructed using 7mm overlap boards and 28mm x 28mm thick frames. The 8mm thick OSB roof is topped with green mineral felt and the floor is made from 16mm timber boards for superior weight-bearing capabilities. The windows and doors have 2mm thick shatter-resistant acrylic glazing. A padlockable sliding bolt is included (padlock not supplied) on the front doors. The wood preservative treatment is forced into the timber at high pressure giving increased protection from the elements and removes the need for annual treatment. 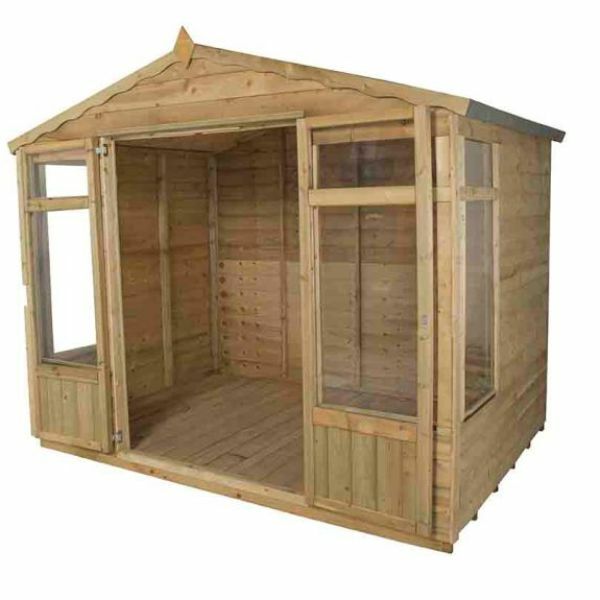 The Oakley Summerhouses are therefore supplied with an extended 15 year manufacturers guarantee against rot.